Four different specimens of Okenia sp. 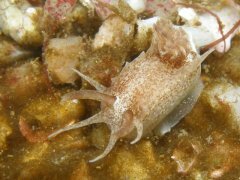 This species was discovered by Helene Zsilavecz on a dive at Windmill, Simon's Town. It was found on sand covered with a thin layer of algae, at about 9 m, on the sandy plain offshore from Windmill. Four individuals were seen, two of them seemingly attempting to mate. Egg ribbons were found nearby. The species seems very similar to Okenia aspersa, found from Norway, the British isles and as far south as France. 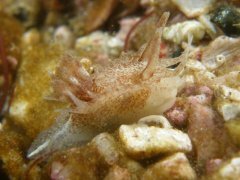 This species feeds on ascidians (sea squirts), specifically on a species which lives below the surface of muddy sand, with the nudibranch occasionally living inside the ascidian. 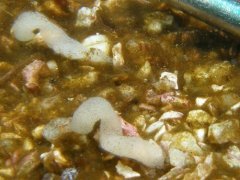 As this information was not known when SURG members found the nudibranch, we cannot ascertain whether there were ascidians under the sand, but it did seem that two of the individuals started digging down into the loose sand. For Okenia aspersa the egg ribbons are described as "consists of a coil like a spring, attached at one end to the substratum", which is exactly like the ones found and photographed. 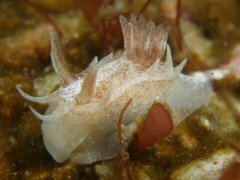 One cannot usually conclude that an egg ribbon belongs to a species of nudibranch near-by, so the photos were taken just in case, but it now seems quite certain that the egg ribbons belong to the new species. The area where the nudibranch was found had been investigated numerous times by SURG members before it was seen, as specific species of klipfish reside there as well, and yet we have never noticed this nudibranch - our tentative conclusion is that the species lives most of the time below the sand surface, and maybe only emerges to mate and lay eggs. This will be investigated by SURG in the future. 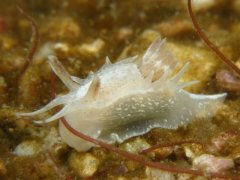 The nudibranchs are quite small, reaching 1.5 cm in length, with the egg ribbons about the same size. As can be seen from the photos there is some variability in pattern density. Nudibranchs of Southern Africa - a guide to the opisthobranch molluscs of southern Africa, T Gosliner, 1987.